The following is an expanded version of the list on our Couples Facing Illness web site (that some followers have had difficulty locating). 1. Create together: cook a meal or new dish; let the patient spouse do the "sou" chef or minor prep work and well spouse can actually do the cooking/baking. Re-arrange your furniture -- let the well-spouse relocate the heavier stuff =), paint a giant poster board any way you're inspired, grow a plant or a small herb garden, make up a secret and "kinda krazee" handshake, complete a cross word puzzle or a picture puzzle, co-write a "where we are now" letter to send to extended family and friends. Use your imaginations together. 2. Practice deep breathing together for stress and PAIN relief (and/or meditate together). If the patient spouse is going through a flare-up, light a few natural soy or non-toxic candles/dim lights, put on soothing music and just sit or lie next to one another. Try deep breathing in unison. 3. Don’t let your bedroom become a “sick room.” When you wake up, get up and go to another room in your house where you can rest and recoup. Change into fresh (comfortable) clothes even if it's a new pair of pajamas or warm-ups. 4. Keep bedroom healthy with positive messages, happy photos, plants, let sunshine & fresh air in, play uplifting music while awake and calming sounds for sleep time. If you live in area where the air is unhealthy put an air filter with ionizer in your room. 5. Play! Try simple board games or cards indoors, draw or paint, make a collage of photos & images that inspire you to feel happy & heal. Put up a soft, indoor mini basketball hoop & practice tossing ball from various positions, use your imagination. Share a computer game that you both like. On the patient spouse's "stronger" or "better" days, visit your local park on mild weather days for a light picnic or fly a kite! 6. Laugh together; watch funny shows/movies. Tell jokes. Do silly little dances, whistle, sing fun songs, recall experiences that make you laugh, and look at photos of fun or funny times. 7. Go for walks together (just get outside). Walk around your house or yard. If patient spouse must use a wheelchair, the well spouse can find an area in neighborhood with sidewalks or even pavement and burn extra calories wheeling your mate. Sit and watch the sunset or go out in early eve and look at stars. 8. Recycle or give away something you no longer use. Replace something old or in disrepair with something new (old shoes, lamp shade, small appliance, books or magazines you no longer need, etc.). 9. Exercise together and encourage one another to eat healthy and be active. If patient spouse is unable to do light exercises, help her/him to do gentle stretches on bed while you stretch beside the bed. If patient spouse is unable to go to gym encourage your well/care-giving spouse to work out and ask them to "do an extra set or walk an extra block" for you! 10. Break your routine occasionally; go for a drive on a scenic road, visit a new exhibit at a museum during off hours, try a new recipe or restaurant (order "to go" if you don't feel like eating out). Listen to a new kind of music. Learn some words & a few phrases in another language and practice saying these to each other. 11. Do something kind and show appreciation for one another each week. Buy or make a small gift (poem, card or note of thanks, small non-toxic scented candle or soap), do a small chore or errand that your mate normally does, leave a loving message or text on your mate's cell phone, etc. 13. Take turns reading small sections of an inspiring book, scripture passages, and inspiring and uplifting quotes. Start with just a 3 to 5 minute reading. Also, listen to inspiring stories, scriptures, or poems, together on audio CD. 14. For special events (birthdays, anniversaries, etc.) splurge and have someone come to your home to prepare and serve dinner, get his & her massages, invite a friend, church member(s), or neighbor(s) over to play a musical instrument. 15. If you have children at home, ask them to do a small play or performance for a weekend night. (Have organic pop-corn or chips and salsa & beverages afterwards). No matter how difficult things can be at times, try to remember to lighten the moment with a silly song, joke, gesture, etc. Do small things to change up the routine and take occasional breaks from one another by going to lunch, a lecture, movie, or coffee, with a friend or family member. 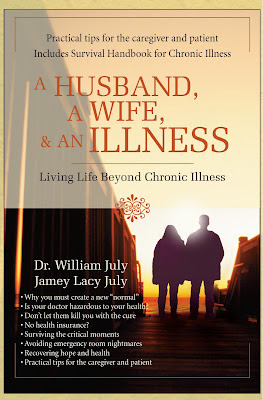 The patient spouse can have a friend over to the house if he/she can't get out. We welcome you to share a unique healing activity that you and your spouse do together (just click on comment below). When we are in the throes of battling chronic illness, as adults, we have specific information and our unique perspective of what we are facing each day (whether we are the one with the health challenges, or, the adult caregiver such as a spouse, parent, close friend, or family member). Since most chronic illnesses last way beyond many months and often, even years, we learn how to look at our lives with a different viewpoint then most people who are generally healthy. In the complexity of all of this, sometimes a kid’s simple viewpoint of what we are going through can actually be welcome. It is common for people with chronic illness to have more than one condition. In fact, most people with autoimmune diseases eventually develop secondary illnesses. For instance, many people with connective tissue diseases will often end up with another diagnosis such as lupus, Sjogrens, Reynaud’s, and/or chronic fatigue, And, where there is chronic inflammation, there is chronic pain, and where there is chronic pain, there is often depression. The depression is not only from circumstances or psychological (which can often be effectively dealt with through counseling, meditation/prayer, and/or, support groups), but it can also be chemical or physiological, as a result of serotonin levels or other natural mood elevating hormones being suppressed by pain (which can be helped by an anti-depressant or anti-anxiety medications). In the complexity of all of this, sometimes a kid’s simple viewpoint of what we are going through can actually be welcome. I vaguely remember being taken on the stretcher from the house to the ambulance, but apparently there had been quite a few neighbors looking on. A few years after that Thanksgiving interaction with my niece, we had moved to another town to help one of my sisters through a bout with cancer. Unfortunately, my health had worsened as I had developed several more conditions that had truly begun to wreak havoc on our lives. I had signed up to take my sister to special appointments (sometimes an hour or two from where we lived) and to every chemotherapy session, and then to the pharmacy and usually the video store to get movies to watch as she rested through the week-end. During one of these weeks, I had a lupus flare-up and became so ill during my sister’s chemo session that she ended up driving us back home. By early the next morning, I was losing consciousness and I vaguely remember being taken on the stretcher from the house to the ambulance, but apparently there had been quite a few neighbors looking on. While I was in the hospital, my husband had an unexpected visit. When he opened the door, our neighbor’s son, Theo (who was about 9 years old), had apparently been appointed by a half dozen other kids on the block to retrieve pertinent information regarding my ambulance trip to the hospital. When William opened the door, Theo wasted no time with formalities. With the seriousness of a wartime journalist, he began with, “Is your wife sick?” (To which my husband said, “Yes.”) Then he asked, “Will she die?” (“No.”) “Were you sad?” (“Yes.”) “Did You Cry?” (“No.”) And then with a nod of his head, the interview was over and Theo was heading toward the semi-circle of kids standing with their bikes at our front curb, to deliver the vital news. Of course as kids get older, they are capable of a deeper level of understanding about the adults in their lives who are battling chronic illness. And, it’s important to be frank with them (as well as with other adults looking on) about what we truly going through. This helps them to have a deeper sense of gratitude for their own health and ability, and, the important feeling of compassion and hopefully, the inspiration to help those who are hurting. But we, who are going through the throes of chronic pain and illness, can also be buoyed by those simple child-like viewpoints at times. When I’m in the middle of a flare-up, the intensity of the moment can be lightened considerably as I think of those “kid perspectives” and I remember when my “ouwees are gone,” I can go and play. The recent celebration of Easter – which embodies the truest concept of life, death, and resurrection, has caused me to further examine something I’ve been grappling with for a while now; the death of our “Life Dreams.” When a baffling chronic illness and secondary conditions literally derailed my body and health, and, our lives about 10 years ago (I say “our” because when one spouse/parent becomes seriously ill in a family, everyone is affected), we quickly learned how fragile and unpredictable life truly is. As the months and years transpired, and we searched for a diagnosis and a cure, I had dozens of near death moments – some in hospital ER’s and some at home. We became very familiar with the sobering choices of calling an ambulance and going through the often frightening and frustrating experience of an emergency room (because when your health is failing from an undiagnosed chronic illness, treatment is typically more “miss” then “hit.”) Our other choice was to call our closest loved ones -- those who could handle the erratic highs and lows of someone battling the unknown in a quest to stay alive and hopefully recover, and, our Reverend and church family to pray for, and with, us. Struggling to outwit death wasn’t the only battle we became familiar with. As time went on and tens of thousands of dollars were spent in our quest for my healing, we began to experience the death of our dreams…the plans we had made for our marriage and family, for my work and career, even our retirement, were slipping away. After I left my personal training and physical re-conditioning studio and my COBRA ran out, we were unable to get health insurance due to the fact that I was ill (pre-existing conditions). My husband, William, was self-employed as a writer and speaker, so we didn’t have access to a group policy. Subsequently, every medication, every visit to a specialist, every medical test, went straight out of our pockets. We were not able to sell our beautiful home quick enough in a slowed economy and helplessly watched as the bank foreclosed. As I battled the illnesses, we also saw the decline of my body in my physical strength and appearance. William took on various extra jobs including substitute teaching and a brief stint in the retail fitness business (which was a miserable experience for him) to help defray the exorbitant costs of “the illnesses.” I felt like such a burden as he also struggled to balance graduate school with all else he had to do. His goal was to finish as quickly as possible so he could get “a job with benefits” to better afford his wife’s illness. There were plenty of physical, material, and financial losses but the most gut wrenching, painful loss in this whole ordeal has been the loss of our life dreams and plans. We stopped talking to adoption agencies as we realized our hope to adopt a child in need of a loving family, was no longer a possibility. Book projects and lecture series had to be canceled and our dream to travel one day to Ireland and Egypt vaporized. After 20 years of living in a “home,” we struggled to live in an apartment with carpet that left my immune system even weaker due to newly acquired chemical and allergy sensitivities. Our hopes to help our daughter through college were relegated to small tokens here and there and her relying heavily on some scholarship money and school loans. The regular donations we made to charities that were near and dear to our hearts, shrunk to small random tokens, and we actually debated whether or not to ask one of these organizations for help in our struggle. We had always leaned upon our faith for strength but at times even that seemed to fail us. We believed in thinking and speaking positive affirmations and still, after everything, believe in the power of loving thoughts and prayer. When one visit to the ER ended up in a week’s stay at a hospital where I was placed (against our better wishes) upon extremely high doses of prednisone, the devastating side effects seemed to be more than we could bear. My once healthy bones became so brittle that after 6 months, spontaneous fractures had occurred in my hip, ribs, and low back, and I was no longer able to share that simple but sweet evening walk with my husband. My new mode of activity was relegated to a wheelchair or walker. William printed a poster with a photo of me from a nutrition & cooking workshop event I presented a couple of years earlier (featuring a much leaner, fitter, and happier “Before Prednisone” me) and placed it on our bedroom door. The caption read, “This is The REAL You!” But after surgery for cataracts and sobering brushes with breathtaking heart pains – later diagnosed as “unstable angina” (more damaging effects of prednisone) we came to a moment of reckoning; I was probably never going to feel, be, or look, like that woman in the photo again. We sadly agreed to say good-bye to that woman that I had been for most of my life, and threw away that poster. We also realized that we were saying good-bye to most of the dreams we had had for the way our lives would work out. It was time to “put to rest” those plans and to allow ourselves to openly grieve those losses. At that time there was a mini-series on television I was watching called Small Island (PBS 2009) and one of the main characters said, “The pain of lost dreams is too much for any human soul to bear.” I cried from the depths of my soul and from every place in my heart as I thought of those words and said “good-bye” to our own lost dreams. The grieving process has taken some time and still ebbs and flows like the tide, but we’ve slowly begun to embrace the “Easter Factor.” The only salvation from the death of our life dreams is the birth of new life dreams. While it’s essential to experience our grief over such losses, it does not mean that we have to lose all hope. In fact, it is even the smallest glimmer of hope that can give us the strength to rise up from those ashes of death and resurrect new dreams…to birth new life plans. As time unfolds, we are learning to form new possibilities for our lives; still allowing for the miracle of healing while also taking into consideration what we have here and now. Has an illness, injury, or other set-back caused you (and your loved ones) to lose sight of your life dreams? How have you handled this loss? Have you been able to resurrect or re-birth new dreams? We welcome your insights and comments. Deep depression and high anxiety can feel like paralysis of the spirit. When you're deeply depressed you don't want to go anywhere, do anything, feel hopeless, and you can feel numb to even the things that normally give you great joy. When you are feeling highly anxious, you can feel emotinally off balance, afraid, and small things become seemingly huge and insurmountable problems that you feel are all stacked up in a way that sweeps over you like a tsunami. Sometimes you can shake it off and sometimes you can't. When you can't it's time to call upon people who love you and inspire you. If that's not possible, or not working, perhaps it's time for a psychotherapist to help you navigate your way back out of the dark. Don't let depression and anxiety shroud you like a wet blanket because they have a way of gaining momentum and pulling you into a downward spiral. No matter what troubles you, there is a pathway back to feeling better. Reach out for a helping hand. Do your friends and family "get it"? Do your friends and family "get it"? When I say this, my question is, do they understand what you're going through? When it comes to chronic illness, not everybody can understand the experience. Now, I'm not talking about short-term illness, or a surgery that repairs you to almost normal condition followed by a reasonable recovery, ...I'm talking about long-term, life changing, body changing, painful, chronic illness - causing problems that significantly restructure your lifestyle while sending you down a road in life you never even imagined. I've noticed that generally, three types of people "get it". People who have experienced a chronic illness of the same magnitude, people who have witnessed chronic illness in someone close to their heart and felt their pain, and people who are highly empathetic types. Why do some people "get it" and others don't? In our telephone based support group's discussion yesterday, I briefly mentioned this and I thought I'd talk about it more here. When you have a chronic illness, after a while, you find out that not everybody can really handle seeing it or even hearing about it. For some people, it's frightening to see you because you represent a stark reality to them, the reality that it could happen to them. They too could get sick and lose everything. For others, there's the the lack of understanding about some illnesses, especially if they aren't well known or are controversial. Some others don't mean any harm, they just don't have even the most remote idea of what you're living with. ...so what can you do? Where does this leave the person with an illness, where does this leave caregivers, or friends who do understand what's going on? Well, you have to realize and accept that there are those who you can count on to understand and those who you can't count on to understand. You can give information such as websites, books, or television specials to people to see for themselves but that doesn't convince everyone. Once you know who will "get it" and who won't, you can save yourself a lot of grief but turning your attention and energy toward those who will support you. I truly hope you have a network of people in your life who understand what you're going throuigh. But I know many of you find yourselves with less friends and family supporters now than you have had at other times in your life.... so spend time with the people who do understand you because they are truly a treasure and you will find them a tremendous source of inspiration, hope, and warmth. When it comes to managing an illness, like any other big task in life, HOPE is the energy and you will need to power up your engines, day to day and moment to moment. Hope is the oxygen of the soul. ...try to hang on to some hope, even if it is the most teenie tiny spark of hope. It energizes us mentally, physically, and spiritually. ....so don't give up hope. Even when you feel overwhelmed, keep at least a little fire of hope burning so it can once again burn as a fire in your heart and soul. Welcome to Life Beyond Illness! We are excited to share this blogging experience with you. This is the place where you will be understood, feel empathy, and get fresh ideas for facing the challenges of illness in your life or life in the role of a caregiver for a loved one or friend. You'll find the coming articles to be a variety of postings that will be inspirational, emotionally impacting, and even comical. Consider this YOUR place to feel understood.